In one of the most remarkable VFL/AFL finals ever witnessed, the crowd at the MCG has erupted into the chant of the title as American footballer Mason Cox cut loose. As this article is being written, Cox dominates the Fantasy points on the http://www.afl.com.au website as the most impacting player on the field. This isn’t a practice match but an AFL Preliminary final involving two of the great AFL clubs – Collingwood and Richmond – and it can truly be argued that Collingwood’s seven goal lead at half time is built heavily on the back on an American. So far, Cox has claimed eight possessions (seven kicks), six marks (most contested) and crucially, three huge goals in a row that were the integral part of a Magpie goal-kicking avalanche. Rarely has a player dominated a half as Cox has done – NEVER an American. 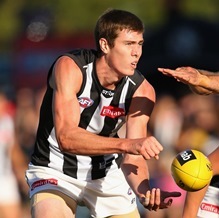 If Mason Cox isn’t already a cult hero, his performance tonight will almost certainly go down in the history books If the Magpies go on and win (and they lead by 44 points at half time), he could become legendary – certainly at Collingwood, possibly wider. To have a crowd chanting “USA” at the MCG during a final demonstrates remarkably how this young American has captured the imagination of an Australian Rules football crowd. His Texan parents are sitting in the crowd lapping up an incredible performance. There is another half to go, and Cox might not get another touch – Richmond might even fight back and win (though it is becoming increasingly unlikely). But Cox has transformed the Collingwood v Richmond Preliminary Final. Fox Footy commentator Brian Taylor remarked at the final siren, "a famous victory on the back of this man here." He was referring to Cox, on screen, who played his finest AFL game to get Collingwood into the Grand Final in one of the upsets of the season. His stats speak volumes. 15 possessions, 13 kicks, 11 marks (8 contested), 2 tackles and even 4 hit-outs. He was in everything. Then there were the shepherds, knock-ons, contests that brought the ball to ground and anything else needed to get his team home. By the end of the match, his teammates had risen. Steele Sidebottom with 41 possessions, Brodie Grundy 54 hit-outs, Tom Landon 13 marks and Levi Greenwood 10 tackles led the stat sheets in a great Collingwood team effort. But no-one will forget Mason Cox's first half, bringing the Australian crowd to chant "USA, USA, USA" not once but half a dozen times. That is just amazing and Cox deserves his place in Collingwood and AFL folklore.